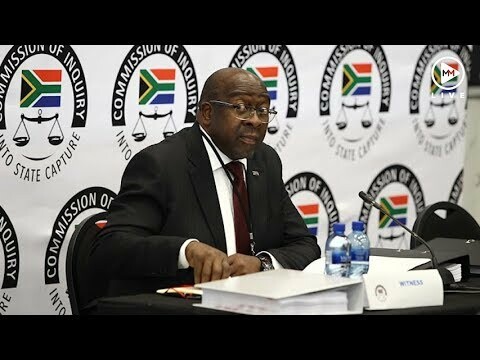 Image: Thapelo Morebudi Minister of Finance Nhlanhla Nene is giving testimony at the commission of inquiry into state capture that is chaired by the deputy Chief Justice Raymond Zondo. The Economic Freedom Fighters have accused finance minister Nhlanhla Nene of lying under oath when he appeared before the state capture inquiry on Wednesday. The party said it was "shocked by Nene's dishonesty" when he testified that he had responded to the party's query on his interactions with the Gupta family. The party said it had written to and texted Nene several times since May but to date they had not received any feedback from him. "He told the Commission of Inquiry that he responded to the EFF letter. This is a lie and the Minister has never responded to the correspondence regarding these matters‚" said party spokesperson Mbuyiseni Ndlozi. Ndlozi said the EFF had even raised the issue of Nene's lack of cooperation in parliament's standing committee of finance. "The committee then resolved the Minister must respond in 10 working days. He still ignored the committee resolution and did not bother to respond‚" said Ndlozi. Some of the questions that the EFF had wanted answered by Nene included whether he met with any of the Gupta family members during his term as deputy finance minister and whether he had discussed Public Investment Corporation (PIC) funding with the Gupta family. The EFF also wanted to find out whether Nene had ever instructed the PIC to award a contract to the Guptas. The EFF claimed to have requested that Nene's office forward the response to their questions on Wednesday following his testimony‚ but claim they were told that "the Minister is still considering our request". It was reported on Wednesday that Nene‚ testifying before the commission‚ said he was not requested to do anything to benefit the Guptas‚ nor was he offered any inducement by the family. He admitted to meeting members of the Gupta family on several occasions‚ including going to their house in Saxonwold and their offices in Midrand. "Whilst Deputy Minister‚ I visited their home in Saxonwold on four occasions‚ always taken by my protectors. I regarded the visits as one of my tasks as deputy minister to engage with different stakeholders in the economy. The visits were short‚ and initially was to discuss the economy‚ and to contribute an article to their magazine at the time 'The Thinker‚'" Nene said. "The later visits were related to a briefing on the impending launch of the New Age. I also visited their Midrand offices again in 2013 before the launch of their television channel ANN7." He said he "became suspicious" of the family's intentions around 2013‚ after reports on the funding of the Estina Dairy farm. During the presidency budget vote debate earlier this year‚ EFF leader Julius Malema claimed Nene was "corrupt as hell"‚ questioning whether he had met with dubious business people and had intervened on their behalf. The EFF has threatened to release what they have on Nene‚ should he not resign. Nene told the commission that his refusal to approve the nuclear deal and the SAA strategy led to his sudden dismissal by former president Jacob Zuma in December 2015. "I believe that I was removed from office because of my refusal to toe the line in relation to certain projects. In hindsight‚ it seems that those projects may have benefited the Gupta family and other close associates of the president‚" Nene said in his statement to the commission sitting in Parktown‚ Johannesburg.